Answer: There are many types of “fire in the sky” that I can explain. The late, great John Denver wrote a song called Rocky Mountain High back in 1972. One of the lines in that song is “… I’ve seen it raining fire in the sky.” It’s generally agreed Denver was talking about meteors as viewed from the high mountains of Aspen, Colorado. For example, see this time lapse video. Denver could also have been referring to an auroral display (aka northern lights). But there’s other types of “fire in the sky” that have nothing to do with astronomy. 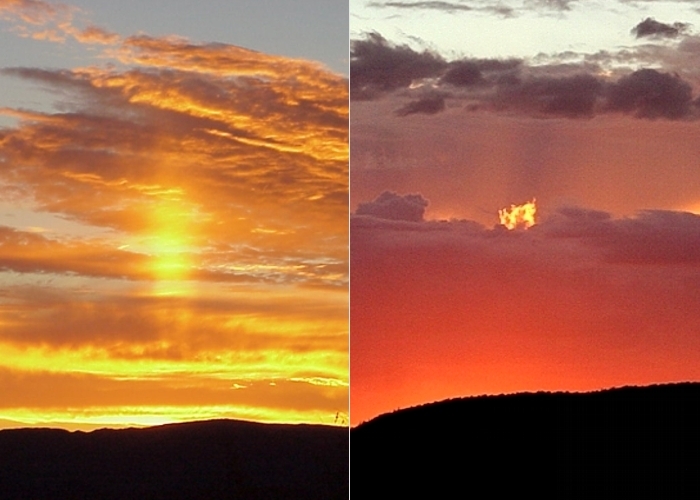 The above-left photo shows a Sun pillar I photographed in 1999. The one you read about in Sky Lights must have been my September 2006 post. Those were the “black and white” days of Sky Lights, when my blog ran in a small local newspaper. In that post I explained how Sun pillars are formed from light reflecting off flat ice crystals. The above-right photo shows what appears to be a “flame” burning at the top edge of a cloud. It caught my eye a couple weeks ago as I was enjoying one of our beautiful Arizona sunsets. The contrast in brightness between the “flame” and the dark background clouds made it stand out beautifully. Of course, the “flame” is just another small cloud positioned between the dark clouds, and reflecting the reddish light of the setting Sun. It lasted about 10 minutes. You ask whether the biblical “pillar of fire” could have been a Sun pillar. I am not an expert in that area, so I consulted with my sister, who is an expert and studies the bible. She explained that the biblical pillar of fire lasted far too long (40 years) to have been a Sun pillar (or a cloud, meteor, or aurora). So I’d have to agree with her on that. Sun pillars usually last for only an hour at most. If you ask me what the biblical pillar of fire was — physically speaking — I’d have to say I honestly don’t know. It was definitely not a common astronomical or meteorological effect. I’m comfortable with the belief that God works within the laws of nature, having created those laws and set them in motion. I have never seen science and religion as opposing viewpoints. On the contrary, I see them as complementary ways to grasp the deep mysteries of existence. This idea was eloquently expressed by the great Jesuit philosopher (and scientist) Pierre Teilhard de Chardin, S.J. (1881-1955). Many past and current scientists share this philosophy.